The new ABUS File Cabinet Locking Bar 5-Drawer model 07050, has enclosed ends which give it a modern look. these enclosed ends also greatly reduce potential shipping damages. There is a conveniently located knob in the center of the file bar for easy and smooth operation. 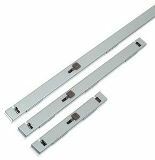 The file bars can be mounted on the right and left side of your metal file or lateral cabinet by simply reversing this knob. There is no longer a need to disassemble the bar. The ABUS File Bar is constructed of heavy 16 gauge steel. All the hinges are locking lugs of 16 gauge steel. All mounting screws are included with each bar. You can easily reverse the bar for application on the left side. The inner slide bar interlocks with a locking lug at each drawer opening when in the locked position providing added security. ( 56" length). *If you have wood file cabinets, please contact us prior to ordering to assure mounting compatibility. 5 drawer file cabinets are subject to UPS dimensional weight.